Bouslimani et al., PNASChemicals stay on our body, even days or weeks after use. In this photo you can see high concentrations of sodium lauryl ether sulfate on the head, even though the subject hadn't washed their hair in days and we shed millions of cells every day. On the woman's neck there are high concentrations of avobenzone, which is found in sunscreen - even though again, that hadn't been used in days. 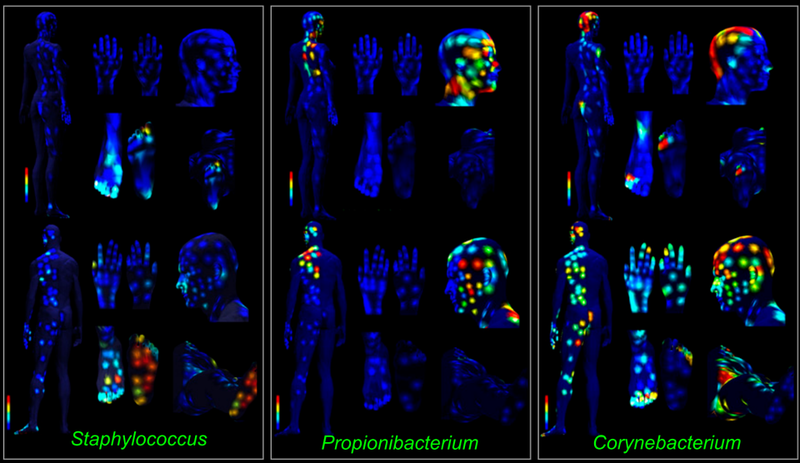 Our largest and most exposed organ - our skin - is covered in and composed of not just human skin cells but also about a trillion bacteria (and even more viruses) along with molecules from chemicals we come into contact with every day. Researchers just mapped the "chemical topography" of human skin in order to figure out what exactly is living and settling on there and how those skin cells, bacteria, and chemicals interact. We have different types of bacterial communities all over and inside our bodies, and while scientists have previously created maps of the skin microbiome, this was the first map to look at what these bacteria are doing and how they interact with the chemicals we're exposed to in day-to-day life. To create these maps, researchers asked a man and a woman (person 1 and person 2, respectively) to skip bathing, shampooing, moisturizing, and using almost all cosmetics for three days (the woman did use deodorant during that time). After three days, they took samples from 4o0 individual spots on each person's body so they could run two different types of analyses to see what they found. It's important to note that these maps are only representative of two people - there is likely a huge variety of bacterial and chemical diversity among humans. Part of the goal here was to show that these 3D topographical maps could be created, which they did successfully, but they also found all kinds of other interesting things. 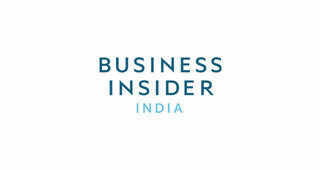 One intriguing finding? The cosmetic products that touch our skin, like soap and shampoo, seem to leave chemical residue that stays on skin for days, weeks, or longer. 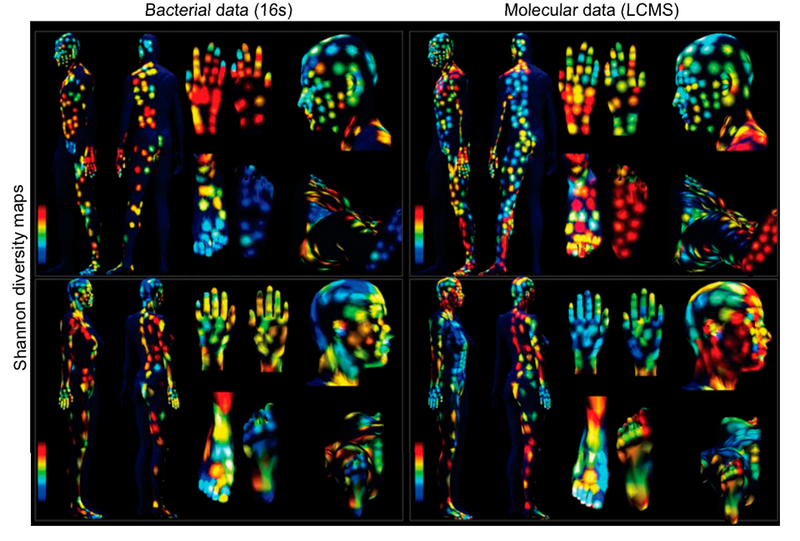 The image below takes a look at the bacterial diversity and general chemical diversity on the skin of both subjects - the red spots have the highest concentrations of different bacterial species or chemicals, the blue the lowest. Bouslimani et al., PNASThese images show the diversity of bacteria and other molecules found on different parts of the skin for both the man and the woman studied. The color scale goes from lowest diversity of species found at blue to highest diversity at red. Hands, which touch everything, carry lots of bacteria and chemical molecules. Other maps show where species of bacteria are most highly concentrated. We even carry dangerous bacteria like Staph, which can cause serious infections. They found it in moist body parts like both subjects' feet, under the woman's breast, and on the man's nose. So what does this all help show us? It'll help us understand how the chemicals we expose ourselves to (especially cosmetic ones) affect the communities of bacteria on our skin over time. The researchers write in the study they published these maps in that this could help us understand how "variation in this complex ecosystem impacts human health and disease." We'll be able to study whether bacteria are appearing in certain areas in response to chemicals we put on our skin, and one of the researchers involved in the study told Wired that we may eventually have a database that shows how certain bacterial and molecular communities are signs of disease. We could even find that we all have our own unique microbe/molecular footprint, like a fingerprint that can be gathered with a cotton swab - Wired reports that that's already being tested in crime labs. Next StoryBinge watching is gratifying! Or is it? Binge watching is gratifying! Or is it? 2Binge watching is gratifying! Or is it?